With more than 3500 students pursuing online degrees, Fulton Schools continues to lead the way in online engineering education. 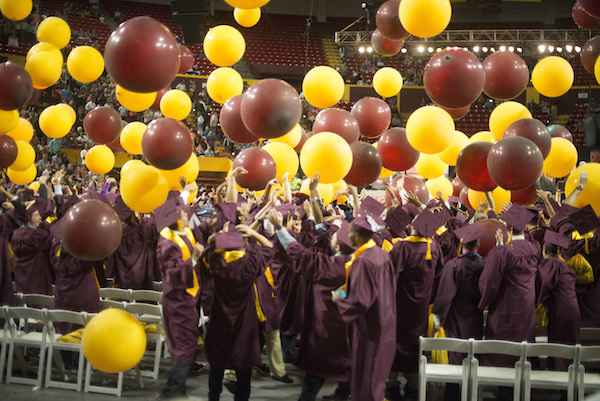 Arizona State University’s Ira A. Fulton Schools of Engineering online engineering graduate programs jumped from a ranking of 14 to 12 out of more than 80 other online programs listed in U.S. News & World Report’s 2016 rankings. There are more than a dozen online master’s degree programs available from the Fulton Schools, ranging from construction management, materials science and engineering to electrical engineering and software engineering. The Fulton Schools also offer eight online bachelor’s programs, including the first four-year, completely online engineering management program, information technology, operations management as well as the first fully online ABET-accredited electrical engineering program. This continual advancement in rankings is testament to Fulton Schools’ commitment to quality online education, said Jeff Goss, Fulton Schools assistant dean and executive director of Global Outreach and Extended Education (GOEE), which oversees online engineering education. In response to the continued growth of online education, Goss said the Fulton Schools are looking to expand capabilities in online teaching and learning by developing new instructional design center. “We work closely with faculty to develop an understanding of student input and how to best to educate online,” said Goss. Dedication to improving online learning has already benefited the Fulton Schools beyond renown and recognition. The School of Electrical, Computer and Energy Engineering became the first school to offer an ABET-accredited electrical engineering program 100 percent online in 2013. Offering the program online provided opportunities to demographics traditionally neglected by higher education institutions. Nontraditional learners such as transfer students, veterans or active military were able to more easily access higher education thanks to a thoughtful and appropriate use of technology, according to ECEE director Stephen Phillips. One such unorthodox and innovative approach embraced by the electrical engineering program with online coursework is the movement away from attempting to replicate the in-person learning experience, and instead striving to use technology to create education more suited to remote learning. “We build instruction around technology, not vice-versa, such as placing a webcam in the back of a classroom and calling it a day,” said professor Marco Saraniti, director of ECEE’s Web-delivered education. Student-instructor interaction required for lessons such as technical diagrams or equations is accomplished with the use of tablets and virtual office hours. 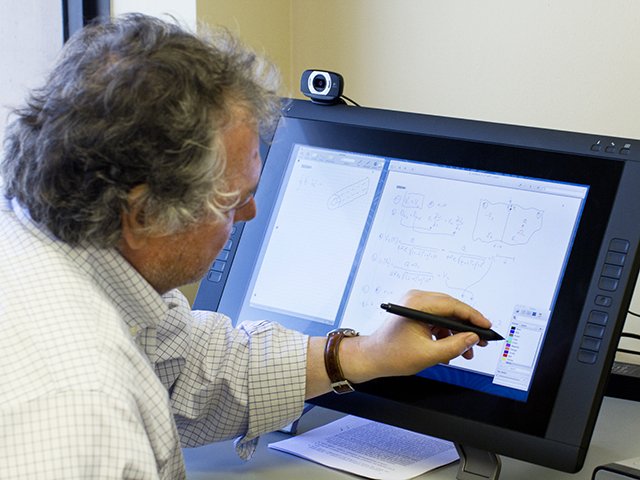 An instructor can share their tablet screen with a student, who can view, in real time, what the instructor writes on the screen with a stylus. Once the session ends, the handwritten notes are saved as a PDF for the student’s use. 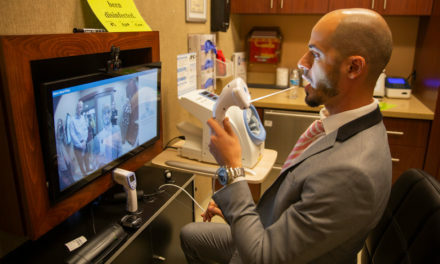 “Throughout the session, the student and instructor can see and talk to one another, streamlining the idea of office hours, as this can be done from anywhere with an internet connection,” said Saraniti. Dan McCarville, professor of practice in the School of Computing, Informatics and Decisions Systems Engineering, first saw the potential to effectively leverage technology for remote education when he helped launch the online engineering management bachelor of science in engineering (B.S.E.) in 2012. This program was the Fulton Schools’ first fully online B.S.E. and possibly the first of its kind in the nation. The availability of the program online instantly drew students who would otherwise have difficulty pursuing higher education in a traditional, brick-and-mortar sense. The online engineering management program saw its first two fully online students graduate in May 2015, with more following in the fall. 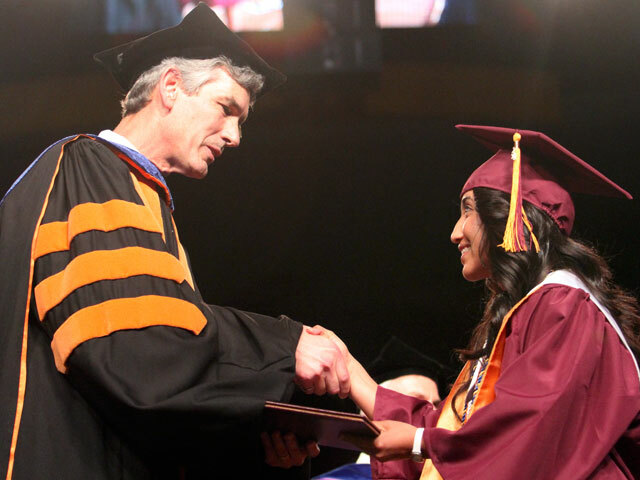 Six more students are on track to graduate in spring 2016. In addition to the bachelor’s programs offered in engineering management and electrical engineering, the Fulton Schools also offers master’s degrees in both disciplines. Looking to the future of online engineering education, GOEE director Octavio Heredia emphasizes the need to continually seek out and adapt technologies to improve the distance learning experience and expand online engineering education’s offerings. While bolstering the programs available and improving technology to deliver a top-notch distance learning experience serve to improve online engineering education as whole, Heredia noted that Fulton Schools has broader aims to pursue with these programs. “Much of our graduate-level online education is intended to help develop the best possible workforce for industry, but we also want to simply support lifelong learning,” said Heredia. The graduate program rankings were determined by a combined score of five factors: interactivity between students and instructors, faculty credentials and training, student services and technology used to deliver instruction, peer reputation of the school and admission selectivity.